In Threadville, we're all looking forward to Edna's wedding. Edna is putting a lot of work into making the day special for her and Gord, but she's also determined that all of the guests will enjoy The Most Perfect Wedding Ever. Don't get me wrong--Edna's not a Bridezilla. She's merely working very hard to make the occasion beautiful and romantic. Everyone in Threadville is attending. I'll be with Clay at the reception. He is, among other things, a dreamy dancer. I can hardly wait. That same weekend, we're holding a Get Ready for Halloween Craft Fair, which should be fun for us and the attendees. We've planned it carefully, and everything is almost ready. We may have a few problems, though. A bunch of people have booked into the local inn for what they're calling a zombie retreat. Does that mean they're all going back into their graves? Or does it mean they'll be lurching around the village and making our world seem a lot less wedding-like? Edna made her own wedding gown and is decorating it. We've suggested that she shouldn't sew every notion she sells in Buttons and Bows onto it, but she won't let us see what she's doing. So to tease her, we're constructing a humungous skirt that she should be able to wear over the dress she's making, like maybe at the reception for a little extra wow factor. Don't tell her about it, though, okay? So why am I biting my nails? It's because of Janet Bolin. That woman writes books about me and my life. So far, every book has focused on a murder that happened here in Threadville. And now I've seen the front cover of a new book--NIGHT OF THE LIVING THREAD. That's our park, our gazebo, and the overskirt we're making for Edna. Does that mean there will be another murder? The weekend of Edna's wedding? Please say no! 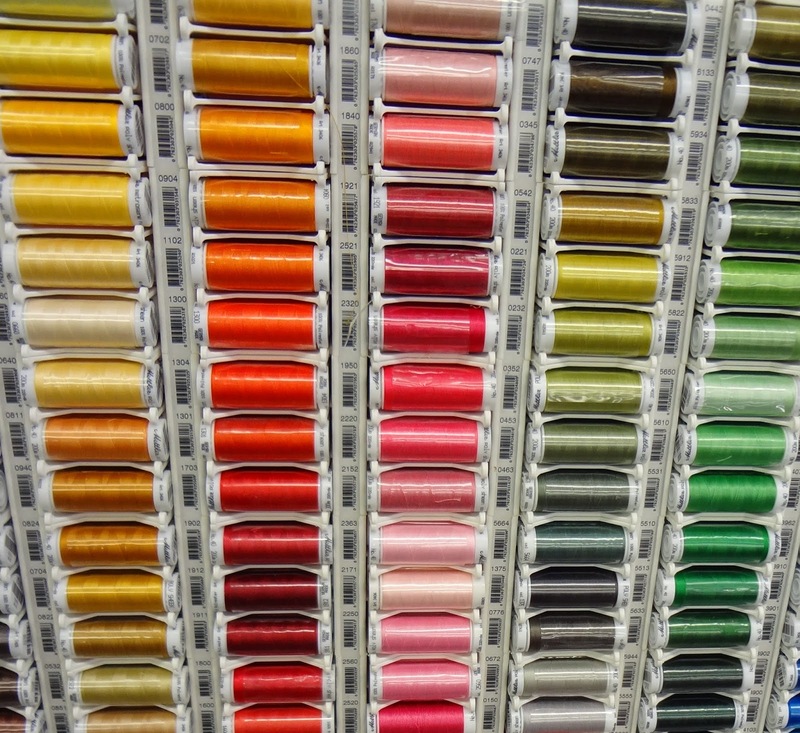 Look at these embroidery threads that I carry in my store--they're vibrant, almost as if they were alive. 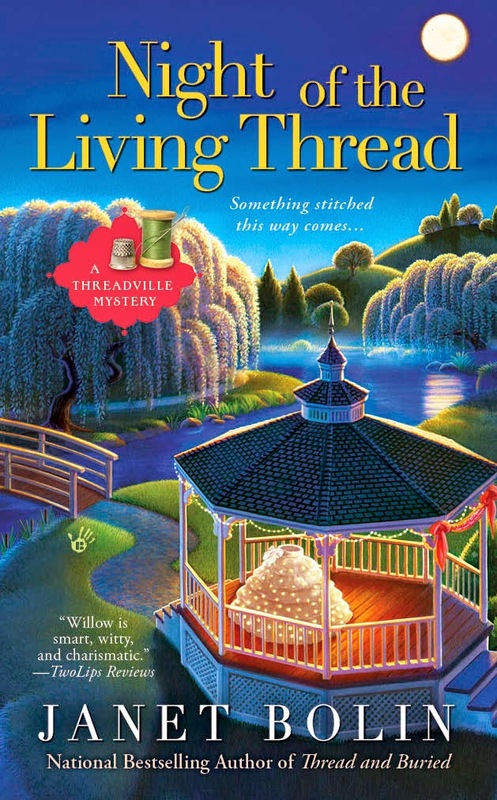 Living thread? Uh-oh. I'm getting queasy. Besides, another murderer in or near Threadville is scary. What can I do? What would you do? 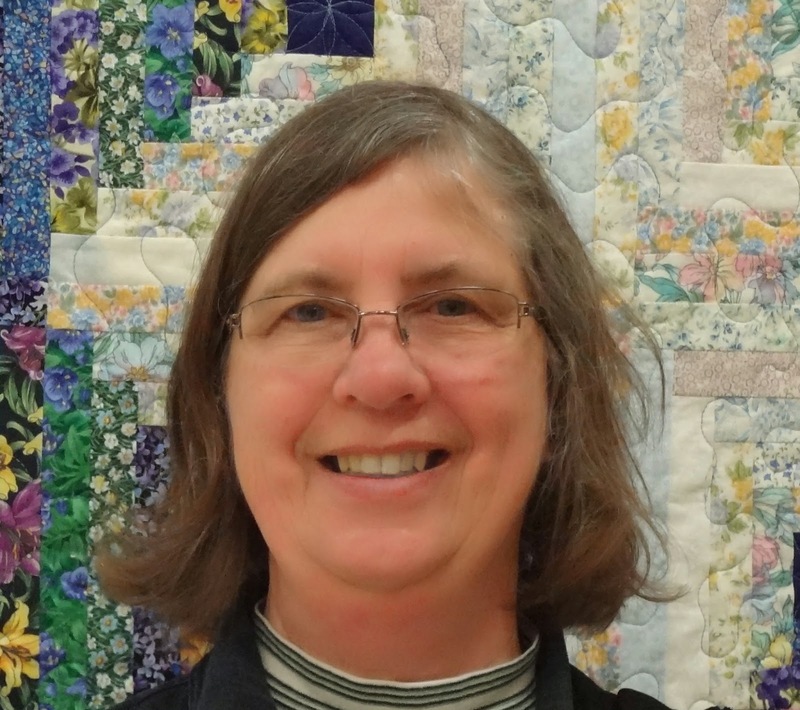 Janet Bolin is the author of the THREAD AND BURIED, THREADED FOR TROUBLE, and DIRE THREADS. You can read about how Willow follows an undulating trail of glow-in-the-dark thread, unravels ancient Egyptian curses, and creeps through a haunted graveyard to unearth a killer in NIGHT OF THE LIVING THREAD, arriving in bookstores June 3 and available for pre-order at these booksellers. Read the first chapter here. No chance of talking Edna into an "away" wedding, I suppose? Is there anything that protects people from zombies? You know, like garlic is to vampires? Good luck, Willow. I'm thinking of you! And as for protection, zombies probably don't run very quickly. And these won't be real zombies, only people dressed up like them. So they'd better not run quickly! Ronna, we hope Edna's wedding won't be more exciting than the usual. Her dress will be extravagant, even if she doesn't want to wear the overskirt we're making. I hope the dress will provide excitement enough! Almost a week left for a chance at one of two copies of NIGHT OF THE LIVING THREAD! Can't wait for the wedding! Hope I get an invite. If not, I'll be sure to read all about it. Phyllis, I think that *everyone* in Threadville (and for miles around...) will receive an invitation to Edna and Gord's wedding. See you there! I cannot wait to read this book! I have been waiting a year! So excited that it is almost here! Willow is uneasy because she knows unexpected things (not good things) are always happening to her. Rest easy Willow, with Clay's strong and capable arms around you nothing bad will happen to you. As far as Edna's wedding, well she with have more to contend with than planned. Edna will have stories to tell for years to come about her big day. And what could be better than sharing stories? I hope you're right, KLeonard, but I'm still worried, especially about Edna.